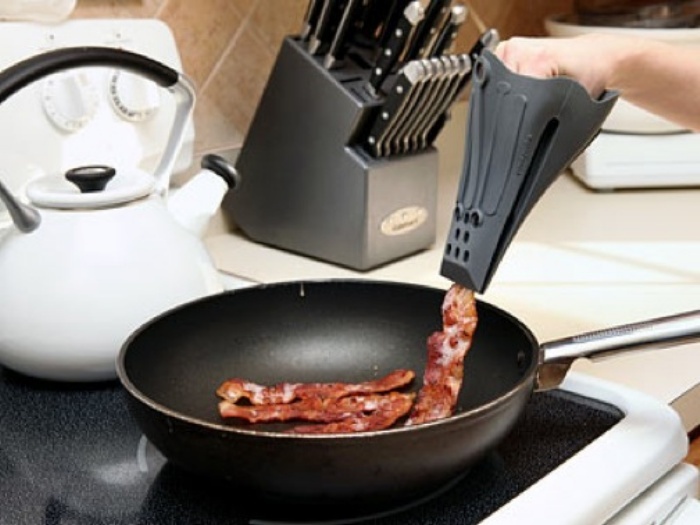 Say Byebye to Burned Fingers and Hello to Fun Cooking with Fingertongs | OhGizmo! By Hazel Chua on 10/02/12 • Leave a comment! Have you ever felt the urge to reach out and flip that burger over with your bare fingers? Or grab that chicken wing right out of the pan once it’s golden? No? Of course you didn’t, not unless you wanted to burn yourself badly in the process. Or you might’ve–and actually did–if you had one of these Fingertongs. They look like giant rubber duck bills or clothes pins, but they’re actually pretty nifty tongs that’ll let you flip, fry, and handle your food with control that your spatula can’t give you. They’re seven inches in length and are dishwasher safe so no extra hassles with clean-up there. These spatulas are priced at $12.21. Pretty reasonable, if you ask me.